As of 2018, nine states and the District of Columbia have legalized the use of marijuana for recreational purposes by adults over the age of 21. 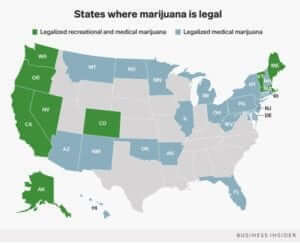 Thirty states have legalized marijuana for medical use, and many other states have decriminalized possession of small amounts. These laws have subsequently launched a brand new industry of growers, distributors and processors, and set in motion a wide variety of public safety regulations regarding the packaging and distribution of marijuana products. For those in the marijuana industry, navigating each state’s requirements can be a daunting task. In many states, marijuana legalization brought about a flood of new marijuana infused products. From pills to breath mints, oils, creams and even high-end cannabis infused meals, each type of product requires special consideration to keep the product fresh, safe and out of the hands of children. Laws about packaging are continually evolving, making things even more complex. At a minimum, most states require an opaque container that is child proof and designed to protect the product from contamination or spoilage. Many states have much stricter laws, such those in Nevada, which go so far as to give specific requirements for an exact thickness of plastic and style of cork for liquid containers. In addition to the package specifics, each state has its own labeling laws. Labeling requirements may differ between flowers, edibles, oils and other products and usually require information such as lot number, weight, health warnings, and evidence of third-party testing, among many other things. The best way to stay ahead of packaging regulations for cannabis products is to do your research and then adopt some consistent best practices for packaging. Marijuana packaging laws are often published on a state’s website. Do not trust blogs, articles or third-party sites to give you the most current information. Stay on top of regulations by checking them often and staying in contact with your state’s regulatory office for updates. Once you understand the regulations you must follow, it is time to partner with a packaging supplier that understands the needs of this growing industry. Look for packaging that is designed for marijuana use; carefully review the features for compliance with state laws. Ask about how labeling can be printed on the package or updated with additional labels, if needed, and be sure the person you are buying from is knowledgeable about the materials and strength of the product they are selling. It is a good idea to stay involved with local policy makers and research any upcoming legislation that could be passed in your state. Then, speak with your packaging company about how you can stay ahead of the changing regulations. Always remember, it is solely the responsibility of the marijuana supplier or distributor to understand and comply with regulations regarding marijuana packaging. Choosing a dependable packaging supplier with a good track record for quality is one of the best ways to avoid a packaging failure that could cost you your business.